Item Number : 07047Feature : SERVER FOR 7045 , 7380Dimensions :&n..
Part of the 100527 Collection by Scott LivingModel Number: 100527..
Wood Finish LATTEWood Finish 2 VINTAGE WHITEDescription	Width	Depth	HeightS..
Wood Finish LATTEWood Finish 2 VINTAGE WHITEDimensions44.75"L x 17.50"W x 5.. Finish ColorDARK COGNACDescription	Width	Depth	HeightBuffet	66.00	18.75	37..
Wood Finish NATURAL HONEYMetal Finish ANTIQUE BLACKDescription	Width	Depth	..
Wood Finish ISLAND KHAKIDescription	Width	Depth	HeightSERVER	57.00	18.00	3..
Wood FinishVARIED NATURALDescription	Width	Depth	HeightSERVER	56.75	18.00	..
Wood FinishNATURAL MANGOMetal FinishMATTE BLACKDescription	Width	Depth	Heig..
Wood FinishANTIQUE NOIRDescription	Width	Depth	HeightSERVER	58.00	18.00	39..
Wood FinishBURNISHED BLACKDescription	Width	Depth	HeightSERVER	70.00	18.00.. Product DetailsAlpine Furniture 1437-06 Granada Buffet Coconut Shell Center.. Product DetailsAlpine Furniture 1468-26 Newberry Buffet Salvaged Grey 3 Dra.. Product DetailsAlpine Furniture 1568-06 Prairie Sideboard Wine Holder Slidi.. Description	Width	Depth	HeightSERVER	63.00	17.75	30.00.. Description	Width	Depth	HeightSERVER	71.75	17.75	30.25..
Wood Finish BITTER CHOCOLATEMetal Finish DARK GUNMETALDescription	Width	Dep.. Product DetailsAlpine Furniture 1968-06 Live Edge Server Buffet Cabinet Lig.. The classic elements of mid-century modern design are harnessed to create t.. Product DetailsAlpine Furniture 551-06 Lakeport Server Espresso 3 Drawers 2.. The ample size and subtle arts and crafts styling of the Junction Pass Coll.. The substantial profile of the Cabezon Collection will be a unique addition.. Boldly designed, richly finished and beautifully accented, the unique aesth.. The modern traditional styling of the Oratorio Collection paired with two d.. Subtle contemporary styling combined with the rusticated finish of the Roux..
Modern styling is softened with the juxtaposition of metal and wood in theA..
Rustic industrial styling lends accent to the transitional design of the Wh.. Simply classic in its form and function, the Hyacinth Collection will add d.. The look of casual country styling invokes the feel of a warm and inviting .. The counter height design of the Brindle Collection will provide the perfec.. Inspired by the aesthetic of a casual country kitchen, the Willow Bend Coll..
Elegantly designed for your casual traditional dining room is the Summerdal.. 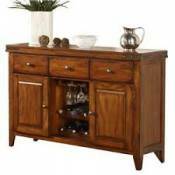 Item Number : 60259 KITFeature : KEENAN WALNUT SERVERDimensions :.. Item Number : 60744Feature : SERVERDimensions : 63"x20"x31"H.. Product DetailsAlpine Furniture 6084-06 Trulinea Sideboard Dark Espresso Fi.. Item Number : 61004Feature : SERVERDimensions : 60" x 20" x .. Item Number : 62084Feature : SERVERDimensions : 52" x 18" x .. Item Number : 62094Feature : SERVERDimensions : 54" x 16" x .. Item Number : 64094Feature : SERVERDimensions : 48" x 29" x .. Item Number : 66104Feature : SERVERDimensions : 64" x 20" x .. Item Number : 66925Feature : SERVER WITH MARBLE TOPDimensions :&n.. Item Number : 66926Feature : SERVER WITH WOOD TOPDimensions :&nbs..
SERVER70133DIMENSION: 48" x 18" x 36"HFEATURE: Faux Marble TopPackage: PKG:.. Item Number : 70169Feature : SERVERDimensions : 54" x 18" x .. Item Number : 70314Feature : SERVERDimensions : 54" x 16" x ..